THIS summer is likely to be a big one for Edinburgh bar The Blackbird. The venue, which is owned by independent bars group Big Red Teapot, will be making a feature of its SLTN Award-winning outdoor area with new drinks and new furnishings. It will be the latest evolution of a space that has been a key facet of the venue since it opened in 2012. Formerly the Auld Toll Bar, the unit was taken on by Big Red Teapot as the company’s third venue after opening Hamilton’s in Stockbridge and Treacle on Broughton Street. The former traditional pub was completely transformed by its new operators. “It was the first time we didn’t just do a facelift,” said Colin Church, who runs Big Red Teapot with co-founder Martin Luney. While the work to the interior was significant, one of the most important parts of the project was the development of yard space at the rear of the property into a beer garden. Martin said: “The fact we had an outside space absolutely was an influence on what inside looked like. Because it has to flow. “ It can’t be a disconnected space. But at the same time we weren’t going obvious and going ‘oh we have a beer garden so let’s put loads of flowers and plants everywhere inside and then follow that outside’. As with the three other Big Red Teapot venues (the company opened The Voyage of Buck in late 2016) all design decisions were made by Colin and Martin. And ensuring the space was fun and quirky was hugely important to them. ““I always say that designers pick things that are useful, and they’re so skilled, but sometimes they can forget the fun,” said Martin. While the bar’s interior contains several references to Lewis Carroll’s Alice in Wonderland (a giant pocketwatch adorns one wall, a mural referencing some of the book’s characters appears on another) the operators turned to a more contemporary creative figure for their outdoor area. 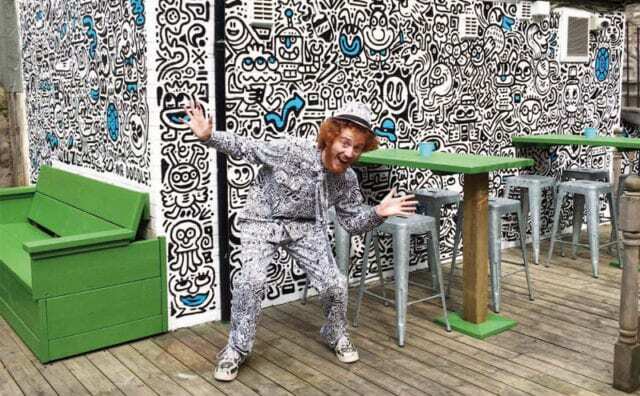 English street artist Mr Doodle was recruited to create an original mural for the beer garden. “It’s a beer garden, but it still had to be cool,” said Martin. The mural was created in summer 2017 and continues to feature in the area today. It’s a source of pride for the directors, who hired the artist when he was still building his reputation. In the meantime Mr Doodle has gone on to complete installations all over the globe and amassed 1.9 million followers on Instagram. Closer to home, The Blackbird has enjoyed its own victories. In November, the venue picked up the trophy for Best Outdoor Area, in association with Magners, at the SLTN Awards. 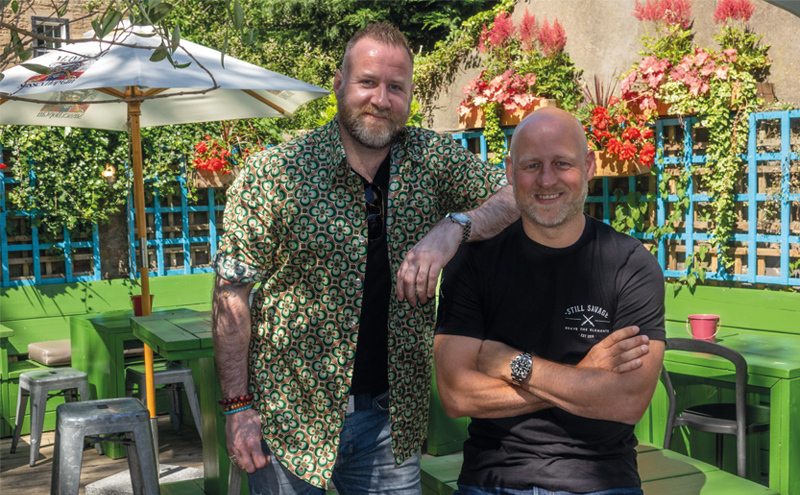 On the back of the win Colin and Martin have teamed with Magners parent company C&C Group to transform the outdoor space into a cider garden for the duration of the summer. The partnership will see C&C supply a range of materials to The Blackbird, including branded cushions and parasols, heaters, planters and a fridge for the area’s bar. In addition to a range of ciders the summer drinks list will lean towards low-ABV serves, with spritzes and highballs featuring prominently. “It’s not using less spirits, it’s using different [ingredients],” said Martin. “It’s using amaros and vermouths. Non-grape wines is a massive thing for us, or it will be going into spring and summer. As with any changes made with their outlets, the summer offer was put together with a finger firmly on the pulse of trends in the city and the wider culture. In addition to low-ABV drinks serves, which cater to the current health living trend, the growing awareness of environmentalism and reducing waste has influenced both the food and drinks menus. Martin said: “Everyone’s so much more aware of the planet now. “There’s a massive movement on vegan foods across the whole city. It’s something we’re doing really heavily in Treacle and here, and that’s going to filter into our drinks as well. Staying on top of current trends is hugely important to the directors. In addition to annual research trips to see what is happening in bars overseas, the company’s own staff are a resource. Colin said: “We’re both 43 now. We’re not 23 anymore. “So we ask our staff what kind of music they are listening to, what food they are eating, what drinks they’re having, where are they going, what TV are they watching. And whether it’s developments in the beer garden or changes to the bar’s food and drinks lists, getting the word out to The Blackbird’s customer base is vital. Social media is one of the main tools the company uses to keep in touch with its customers and generate word of mouth. While Colin overseas the feeds for the four venues, each of the bars’ teams are also encouraged to keep their Facebook, Twitter and Instagram feeds regularly updated. “It’s a mixture of posed, set photographs – because it’s nice to see beautiful things – but at the same time that’s not all you want to see,” said Martin. “You want to see ad-hoc things happening and fun and humour. 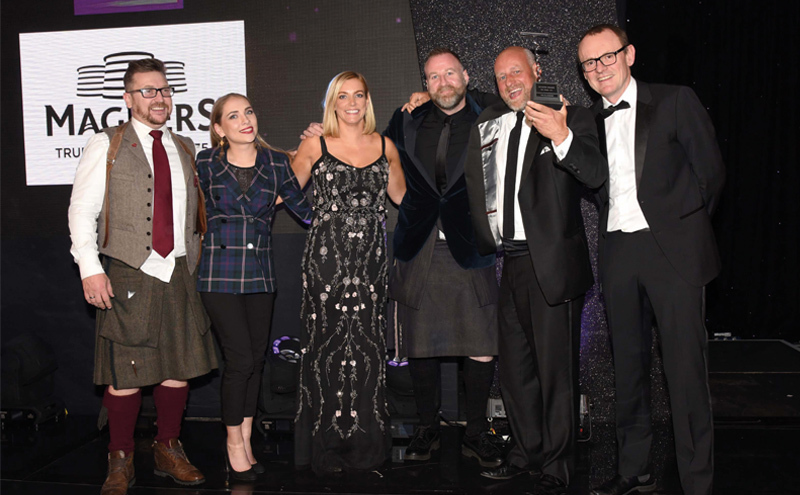 Beyond the summer, it’s likely the operators will come up with new and different ways to make the most of their award-winning outdoor area. The approach, said Martin, will stay the same. “The same ethos we had last year when we won the award we will carry on,” he said.